We manufacture and export a wide range of H-SERIES - HIDT - H4DT, which is manufactured in tandem with the set industry standards. Our range is available in Din sized (48mm x 48mm) with enclosure provided for panel/track/screw mounting. These Timers also have in-built front terminal protective cover for the safety of the user. 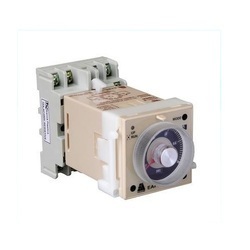 Looking for Timer H-Series ?